Illinois’ twin cities of Bloomington and Normal (which is technically not a city, but a town. Discuss…) comprise a relatively small metropolitan area in Central Illinois, about 2 hours south of Chicago and 2.5 hours north of St. Louis, Missouri. Together, the cities have around 125,000 residents, with 50,000 in Normal and 75,000 in Bloomington. Bloomington and Normal are also immediately adjacent to one another, with no gap in between them, and thus effectively function as one city. In fact, they are almost always referred to together, as Bloomington-Normal, B-N, or even the Twin Cities. Home to State Farm Insurance and two educational institutions, Illinois State University and Illinois Wesleyan University, which together have over 22,000 students, Bloomington-Normal has a more white collar, professional persona than many other Central Illinois cities. Bloomington-Normal was an important stop along Route 66 during its heyday, and as the famous highway grew in popularity it became congested – especially through cities and towns where local and cross-country traffic mixed. Even before the interstate system debuted, which would largely supplant Route 66, many bypasses were constructed around the cities and towns Route 66 passed. One such bypass, known as Beltline Road (later renamed Veterans Parkway), circumnavigated around Bloomington-Normal to the east, and opened in the 1950s, a full decade before Interstates 55 and 74 were built around the cities to the west. 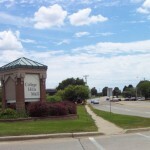 As Route 66 became obsolete for cross-country trips, supplanted by Interstate 55 and subsequently removed in this area by the late 1970s, it became a mostly local thoroughfare and Bloomington-Normal’s dominant retail strip. 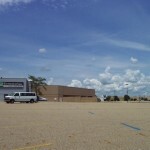 In 1967, the Eastland Mall opened along this strip at the corner of Route 66 and IL 9. Expanded through the years, Eastland Mall is the biggest and only enclosed mall in Bloomington-Normal, but this wasn’t always the case. 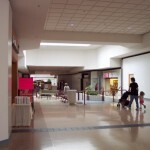 In the mall-crazy late 1970s, a developer decided that one mall wasn’t enough for little Bloomington-Normal, and made plans to build a second enclosed mall on the same strip. 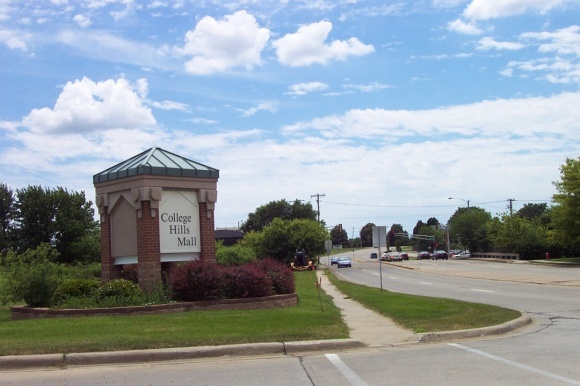 Located just a mile north of Eastland Mall along Veterans Parkway/Old Route 66, the College Hills Mall opened in August 1980 with anchor Carson Pirie Scott and a single-level T-shaped corridor of stores. 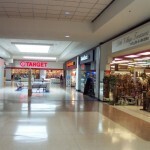 The second anchor, Montgomery Ward, opened about a month later, also in 1980, and a third anchor, Target, opened in 1982. 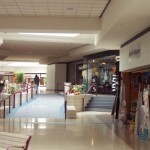 Only about 60 percent the size of Eastland Mall, College Hills Mall never had the same cachet of stores, but it served as a successful ancillary to it for a number of years. 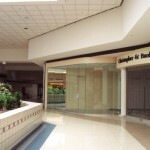 An anchor change occurred at College Hills Mall in 1989 when Peoria-based Bergner’s purchased Chicago-based Carson Pirie Scott. 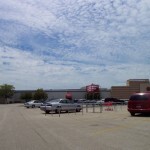 Because Bergner’s did not want to operate two adjacent stores in such a small market, the Carson’s at College Hills was closed in favor of the extant, larger Bergner’s at Eastland. 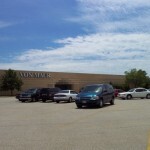 Following the departure of Carson’s at College Hills Mall, management quickly found a replacement for the space – Davenport, Iowa-based upscale department store Von Maur. For those unfamiliar with Von Maur, it is considered in the same class and quality as Nordstrom and Lord and Taylor, a step up from Carson’s/Bergner’s. A weird fit for an ancillary mall, it gave College Hills an upscale cachet that management thought might translate into greater success. 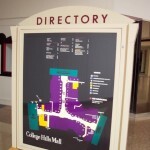 Unfortunately, though, the location of Von Maur at College Hills Mall did very little to upscale the mix of stores there. 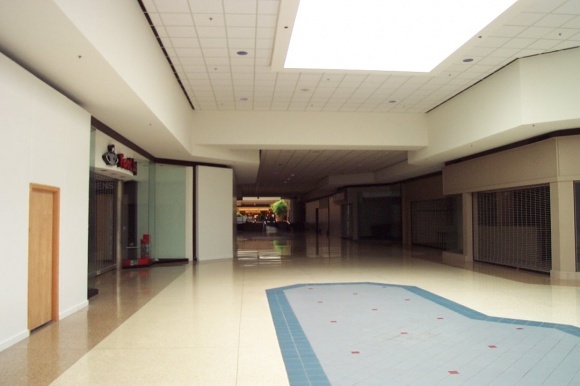 In fact, during the 1990s, the mall began a slow period of decline, and finished the decade in extremely poor shape. 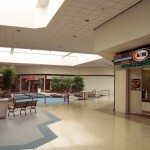 In the early 90s, College Hills Mall had a decent mix of stores, including MC Sports, Kay-Bee Toys, Waldenbooks, Spencers, The Buckle, Foot Locker, and Champs Sports. But the loss of a department store anchor and a change of ownership in 1997 brought an irreversible decline from which College Hills would not recover. 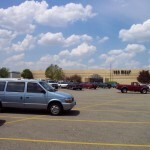 In 1997, Montgomery Ward exited the mall amid a round of closures and in 1999, a Hobby Lobby crafts store was brought in to replace it. 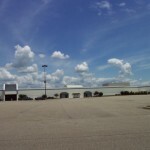 Discounter Stein Mart moved into the middle of the mall, taking a few dead store spaces in 1997, but this move turned out to be an unprofitable mistake for the chain and it closed in 2000. Meanwhile, many of the aforementioned national chains closed and were not replaced due to lacadaisical remote management by the Chicago-based owner of the mall. 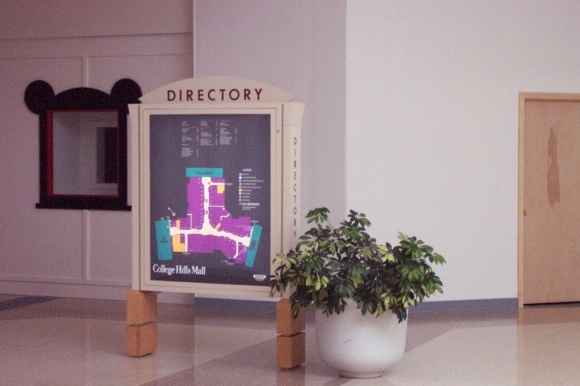 By the 2000s, College Hills Mall was in serious decline with many vacancies as in-line stores closed and weren’t replaced. 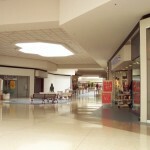 Many of the stores relocated down the street to the larger, more successful Eastland Mall, which completed an expansion in 1999, adding a Famous-Barr anchor. 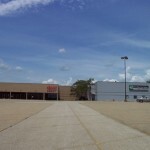 By mid-2004, only 11 tenants remained at College Hills Mall, including the three anchors, Target, Von Maur, and Hobby Lobby, with Radio Shack, Payless Shoes, Bath & Body Works, GNC, Christopher & Banks, Diamond Dave’s Mexican Restaurant, and some local stores among the remaining that were left. 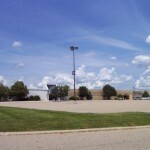 In 2004, ownership changed again and the College Hills Mall was purchased by Peoria-based Cullinan Properties, who had recently developed the successful Shoppes at Grand Prairie outdoor mall in Peoria in 2003. Given the sad state of College Hills, Cullinan decided to demolish the existing mall and develop another lifestyle center. 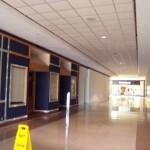 The enclosed mall’s last day was June 30, 2004, when the interior corridors were sealed until demolition began a short time later. 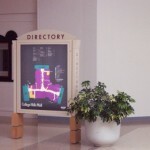 The anchors – Target, Hobby Lobby, and Von Maur – remained open and continue to operate today in their original buildings. 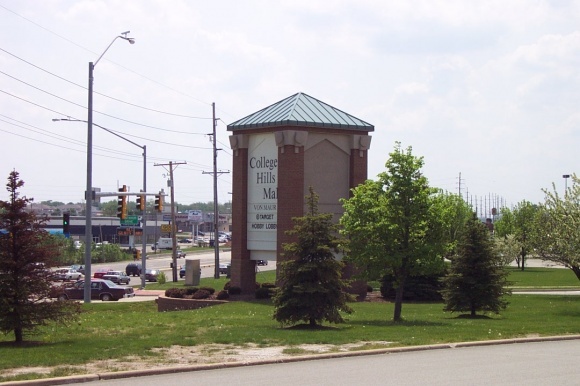 Almost immediately, demolition work began on College Hills Mall, in order to transform it into The Shoppes at College Hills. The extra ‘e’ in Shoppes apparently confers an ‘upscale for ladies’ vibe – there’s no doubt that your mom or girlfriend would enjoy shopping here. All of her favorite stores are present – J Jill, Chico’s, Ann Taylor Loft, Coldwater Creek, Lane Bryant, Yankee Candle, and Bath and Body Works. These, combined with Von Maur, Target, Gordman’s, Starbucks, The Childrens Place, Hobby Lobby, and a make-your-own-stir-fry chain restaurant, will keep mom and all her girlfriends busy all day. In fact, there’s even a Hampton Inn in case they get too tired after all that shopping. I don’t mean to hate on The Shoppes at College Hills – it’s not terrible or anything, just kind of poorly executed in light of the image and vibe they are trying to sell. I mean, it’s definitely not for me, and I’ll certainly concede that it’s better than the hulking dead mall that was there before. 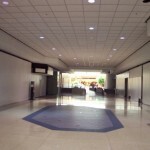 I can’t help but wonder, though, did the enclosed mall fail due to mismanagement? 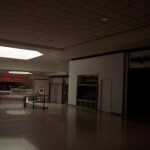 It was pretty dark and dated inside, so couldn’t they have just renovated it and put all these stores in there? Clearly there was a market for a retail center here, and I wonder how many people really want to walk around in the cold, rain, snow, and excessive heat – Central Illinois is a land of extremes, after all. This isn’t the Sun Belt, and ‘perfect’ days are rare. It’s kind of a moot point, anyway, because no one is realistically going to walk around here all day either – it’s not that pedestrian friendly and really set up more like a strip mall than anything else, where you can park near the door of your favorite stores. Want to visit another store? Get in your car, drive over there, and park there, too. 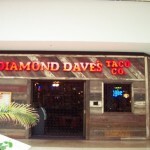 My biggest problem with this place is that the type of branding they’re selling is really a bunch of smoke and mirrors. All they really did was demolish the interior of a dead mall and replace it with a few, much smaller buildings, and a sea of parking lots. There are no definitive pedestrian corridors that encourage people to use them, except the sidewalk in front of some of the stores – which is how any strip mall is set up – and there’s no cohesion bringing the center together. Target and Hobby Lobby don’t even have entrances facing the rest of the development. And yet they are selling a brand, a lifestyle even. Whatever that means. Whose lifestyle? Doesn’t a lifestyle center really need to have some non-retail components such as entertainment options, or more than one restaurant? Some even argue that a true lifestyle concept needs housing as well. 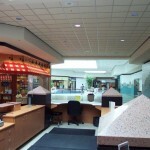 According to the mall’s website, which also states that the Shoppes are “where outside is in style”, “The Shoppes at College Hills has a stylish fountain in the midst of our outdoor lifestyle center in a beautiful, relaxing setting. The fountain is the base for a sculpture entitled “Adventure” by Jim Davidson. The fountain and sculpture pair encourages the shopper to rest or meet friends near the soothing sound of its waterfall.” This is nice, don’t get me wrong. 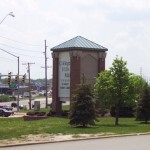 But they fail to note that the fountain is really located in the corner of one of the parking lot seas, and that the whole setup of this place really lacks cohesion and encourages driving between the stores, not meeting at a fountain in a far corner of the parking lot. 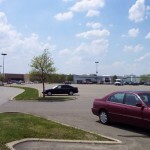 When you go to a strip mall or big box center, do you often walk to the far edge of the parking lot to meet? I don’t. There’s absolutely no reason to. There are definitely good ‘lifestyle’ centers that pass muster, with legitimately cohesive plans and a density that allows for well-placed pedestrian concourses that will actually be used. This just isn’t one of them. Many of them have pedestrian-only corridors, like Easton Town Center in Columbus, or if the corridors allow cars the focal point is not hindered by automobile traffic but rather a dense, urban-like streetscape, like Victoria Gardens in southern California. Lacking encouragement for people to walk around and linger, a lot of the stores miss out from foot traffic walk-by sales. On a different level, without people walking around and staying a while there is less of a community feel. Plus, it doesn’t look as nice aesthetically, either. By the way, Cullinan’s outdoor mall in Peoria is a pretty good example of what a lifestyle center should be, so that makes this even more perplexing. 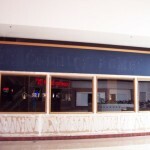 I visited College Hills Mall in May 2001 and June 2004, just a couple days before the mall closed forever. 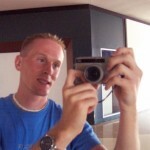 Feel free to leave your own experiences on the comments page. Ah yes. Missed opportunity for me. We went down here in 2004 and I got to poke around some. 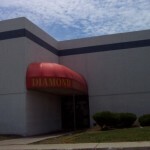 It must have been around the same time, because I remember Diamond Dave’s and Payless were the only two inline stores left. 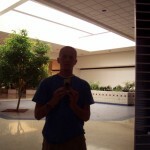 For the record, that was the same trip on which I took the Maple Hill Mall pictures you have. 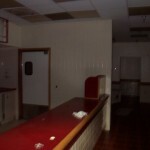 I read about this on DeadMalls.com earlier. 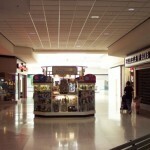 This is very similar to the Bedford Mall in Bedford, NH. 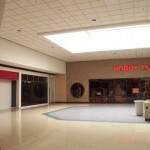 It’s so bizzare to watch a few stores cling to life in a mostly vacant mall. They do have the treasure of a seemingly never-remodeled Papa Gino’s that is like walking into a time warp to 1980 and is somehow chugging along. I am suprised though that College Hills ended up closing because of the Target in it. I would think that would have generated enough action to keep it afloat. @Michelle, Target wasn’t enough to save Maple Hill. 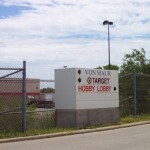 In fact, the Target wing was already about 95% vacant before Montgomery Ward closed. What they could have done with the layout is add a parklike focal point just outside of Von Maur’s mall-facing entrance. 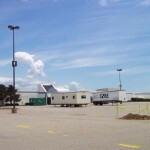 Upscale restaurants and additional stores could have been located on one side. The extra ‘e’ conveys pretentiousness to me. Something like ‘College Hills Plaza/Square’ would have been better, imho. This development is probably targeted more towards upscale families and young couples than just women. Or College Hills Centre, but whatever floats their boat. A small market with solidly middle class employers (State Farm, the colleges) would actually be a good place for a store like Van Maur. There is probably a base of shoppers there and in surrounding towns who would otherwise do “big shopping” in Chicago or ST L once a year or do a lot of mail order for stuff they couldn’t get locally. 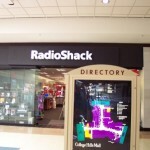 A “right size” store calibrated to the local market could do well there. Upscale stores like Halle’s in Cleveland sometimes had long runs in teriary markets (Erie, PA in their case) with less affluent bases. 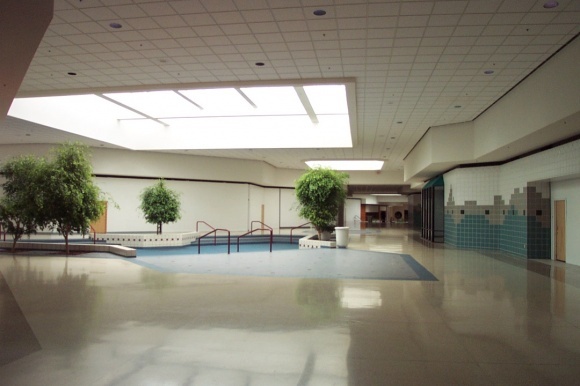 I do miss this old mall. Many of the chain stores had locations at Eastland and in College Hills before the Stein Mart fiasco. Waldenbook and Musicland had exterior exits. 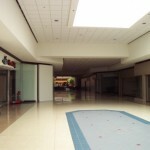 From 1997 to 2003, the mall got deader and deader. 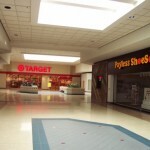 Eastland Malls remodel and expension didn’t help College Hills at all. 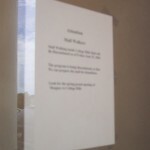 I was in the mall on its last day, some of the storefronts were open for the demolition crew; it was my only time in Stein Mart. The blue fronted place was Old Country Buffett. The new place is a terrible disappointment. 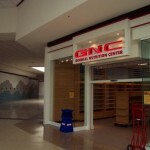 Parts of the complex have never had a regular store in it. I shop at Target and Gordmans only. Never really scene any customers at the “old lady” stores either. The Shoppes just seem like a bunch of randomly placed building surrounded by an enormous parking lot. One of the weird things about the new lifestyle center is the collection of upscale stores…and a Hobby Lobby? Really? 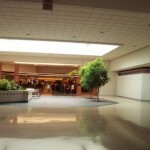 I attended ISU 1987-1991 and remember this mall well. 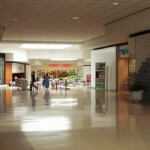 Eastland was the better mall, but this one was easier to get to without a car. It was a thriving place back then. 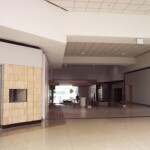 I returned to Normal several years later, 2000/2001 and visited the mall and was shocked that it was almost empty at that time and suprised again a few years later when it had be knocked down and redeveloped. 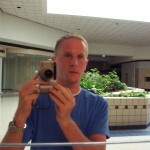 I am a Bloomington-Normal Native and remember the College Hills Mall in its Hey Day during the 1980’s to early 90’s. My family ate many a meal at Old Country Buffet and Diamond Dave’s. I always loved the smell of the Barrels and Bins store and browsing through the neat signs and wierd stuff in Spencers. I think Pier One started out here before moving into the old Wal Mart Plaza. I also remember begging my parents to visit the pet store that was located by Carson’s (before the upper class Von Mauer took its place) or play a few video games at the Gold Mine Arcade (I loved the atmospohere of that place…so dark and mysterious…. it seems there no more arcades like that these days). 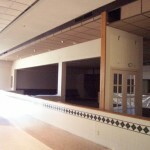 It was sad to see the mall go as it was a staple of my childhood. It seems like once Ward’s left it started a domino effect that couldn’t be stopped. I moved to Kentucky in 2001 but my parents still live in the area. The only store I have been to at the “Shoppes” is Gordmans (I don’t count Target or Hobby Lobby as they were there before the mall was torn down). I have searched for some old pictures from both College Hills and Eastland from the 1980’s but haven’t come across anything. Just thought I’d share a few rememberances. Amanda said it well. About the only store I go to even occasionally is Hobby Lobby now. Once a year Target maybe. 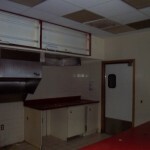 The remodel is sterile, uninviting. I don’t find it a remotely comfortable place to be, and it’s not exactly convenient to have the space between stores open to the elements the way it is. Illinois isn’t the right climate for that kind of remodel. 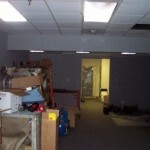 But, they drove out the small stores with the high rent long before the remodel became public knowledge. Shame, I’m not sure if the rent was deliberately raised to drive people out for the remodel, or if they realized too late that the rent was too high and driving people out so that they lost profit (making the remodel the easiest quick fix), but It is a shame. Very cool that you took some pictures of College Hills for posterity! 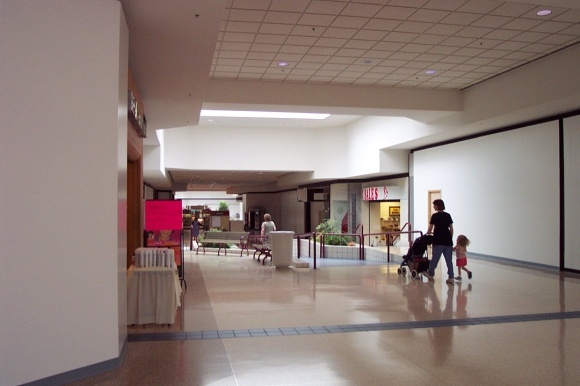 I grew up in B-N (within walking distance of the mall) and have many fond memories of family trips this mall, especially the mid- to late-80’s. Eating popcorn and cherry ICEE from Target, browsing in Montgomery-Wards and lusting after toys at KB, among many other great memories. I specifically remember when they’d haul boats into the mall and my Dad and I would go check them out. 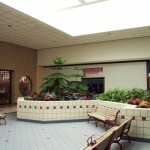 I also remember you could smoke inside, and people would chill in that sunken center section and puff away! 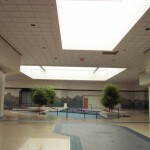 This mall was, in my opinion, the cleaner and nicer of the two; it was newer and seemed to attract a ‘nicer’ element (but, then, Central Illinois was rather homogenous in those days.) Eastland definitely had more variety, and I have great memories of that mall as a kid, but Eastland will always have a place in my heart!